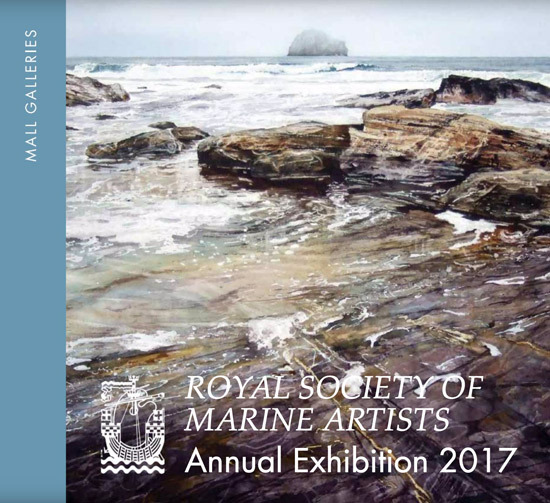 The Annual Exhibition of the Royal Society of Marine Artists opens at the Mall Galleries on 5th October and continues until 14th October (open 10am - 5pm each day). 398 paintings and drawings will be on display various media. 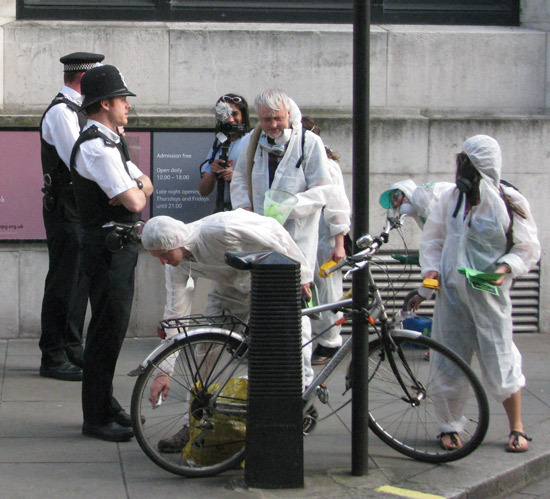 This is an open exhibition so works are by both members of the RSMA and those selected via the open entry. It includes a selection on members artwork. This catalogue is organised by the Mall Galleries marketing team. 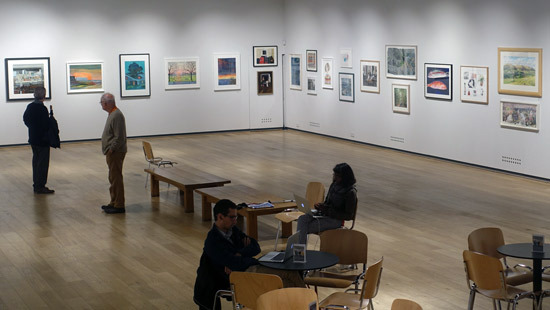 The option to make it available for view on Issuu is available to all the member art societies of the Federation of British Artists who exhibit at the Mall Galleries. A double page spread of a selection of members artwork. 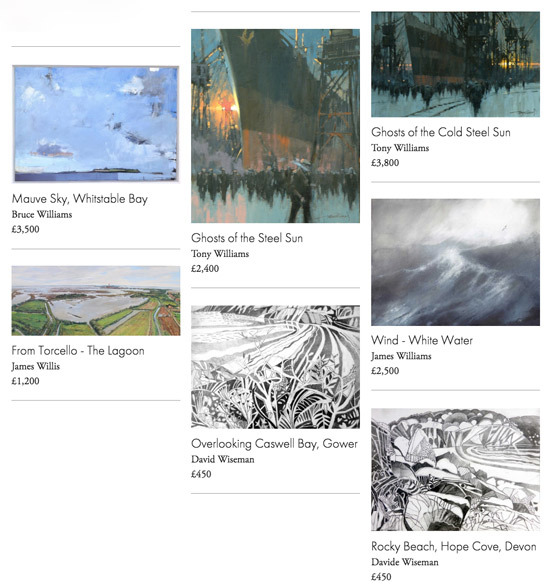 On this page you can also see a sample of the paintings which will be on display - which includes the title, media and price as well as the artists name. 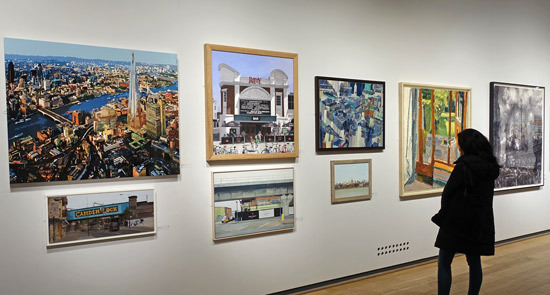 Finally, the Mall Galleries website has images of ALL the artworks in the exhibition - because of course submission is now digital so artists need to produce images! What's more you can also buy them in advance of the exhibition opening! If you click the title this will bring up an image of the painting and provide all of the detailed information about the media. Posted by Making A Mark on Saturday, September 30, 2017 1 comments Who's linking to this post? Guess where I am this afternoon? If you want to see it you've not got much time left - just over a week in fact. It finishes on 8th October (and is closed on 2nd October). Plus lots of time slots are already sold out. Choose your date and time and book tickets and print them off once you've received your email. The "tickets" were shambolic on my iMac and better on my iPhone! I gather they;re getting a new ticketing app. Let's hope it's one which allows me to store tickets on my iPhone Wallet! Posted by Making A Mark on Friday, September 29, 2017 0 comments Who's linking to this post? Henry Moore’s bronze sculpture Draped Seated Woman - known in the East End as "Old Flo" - has been lifted from the Yorkshire Sculpture Park and is on her way back to the London Borough of Tower Hamlets from whence she came. I've been following this story over the last five years in a number of blog posts (see below). This will be the fifth! why this was a really BAD IDEA! 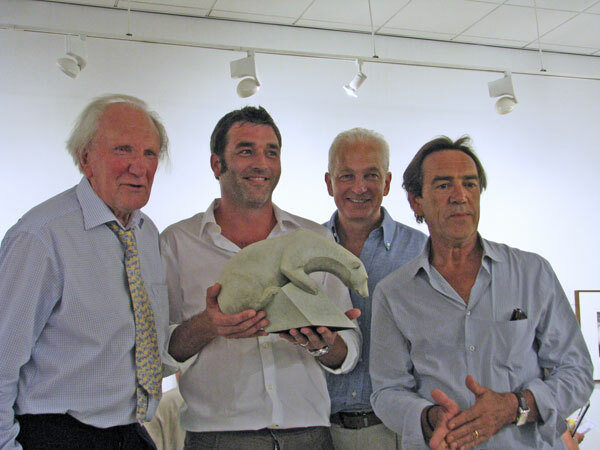 Henry Moore's Old Flo to move to Canary Wharf (March 31, 2017) - as I predicted the only safe place for her in LBTH! 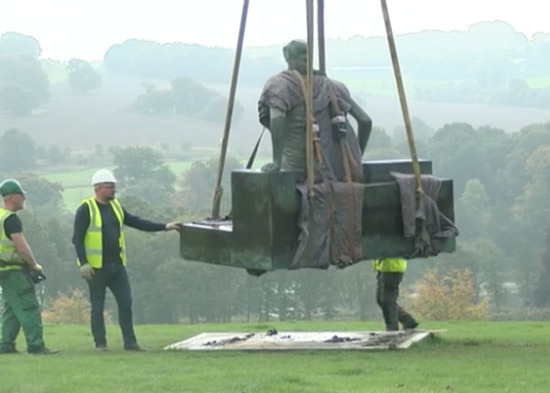 This is the BBC video of Old Flo being lifted from her plinth where she's lived for the last 20 years inside the Yorkshire Sculpture Park. Every time I go to Canary Wharf in the car I keep glancing into Cabot Square which is where she is supposed to end up - just in case she had turned up without any hoohah! She returns to the East End on 22 October 2017. She will be located in Cabot Square, overlooking Middle Dock and accessible to all who pass by. A programme of celebrations, education and outreach will be rolled out while Old Flo is at Canary Wharf. Anyone who would like to receive updates on these activities is invited to contact Canary Wharf at oldflo@canarywharf.com. Canary Wharf Twitter @yourcanarywharf needs to get its act together for welcoming her back to Tower Hamlets - not a tweet as yet. Meanwhile the politicians are all claiming they did it! Posted by Making A Mark on Thursday, September 28, 2017 0 comments Who's linking to this post? 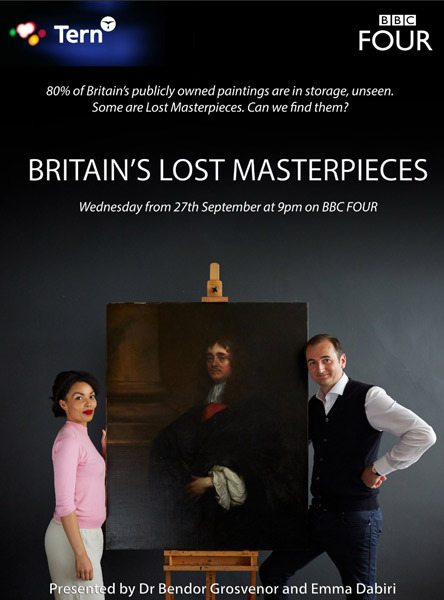 The second series of Britain's Lost Masterpieces starts on BBC4 tonight at 9pm. If you've been wondering why the BBC1 Fake or Fortune team seem to have lost Dr Bendor Grosvenor (Art History Now), it's apparently because there has been a "spat" between him and Philip Gould which "have not been denied by either party"
I gather Bendor sees a clear difference between the programmes and that view might not be shared by Philip Gould. This means they now front and present seperate programmes! As already reported in the press, the first episode is about the holy grail - a lost masterpiece by a past master. the review of a painting thought to be a copy of a Rubens portrait of George Villiers, Duke of Buckingham (constant companion and closest advisor to James I of England / James VI of Scotland in the 17th century). Apparently the subject is regarded as one of the most famous gay men in history! its attribution to Sir Peter Paul Rubens (1577-1640), a famous painter in the early 17th century! The portrait shows the Duke of Buckingham, James I’s lover. The King referred to Buckingham as his husband, and their relationship scandalised the court. Rubens’ portrait of Buckingham was painted in about 1625, but had been regarded as lost by art historians for almost 400 years. The painting is discovered at Pollok House, Glasgow set in the scenic surroundings of Pollok Country Park on the outskirts of Glasgow. The painting belongs to Glasgow Museums. Pollok House with its fine collection of paintings - and 360 acres of Pollok Estate - was gifted to the City of Glasgow in 1967. The house and its collection of paintings are now managed by the National Trust for Scotland and the grounds also provide a home for the Burrell Collection. Previously thought to be a mere copy of a lost original, the picture’s attribution was doubted in part to layers of dirt and overpaint. The background and other areas of the portrait were entirely overpainted by a later hand, obscuring many of Rubens’ trademark techniques. Conservation work carried out for Britain’s Lost Masterpieces by the restorer Simon Gillespie has now returned the painting, which belongs to Glasgow Museums, to its original state, allowing for a new assessment of the attribution to Rubens, considered one of history’s most influential painters and a pioneer of the Flemish Baroque tradition whose work is now worth millions. Overwhelming evidence including technical analysis of the panel on which the portrait was painted proved that it was prepared in the manner used in Rubens’ studio. Dendrochronology (examining the tree rings of wood to date it) showed that the panel was likely created in the early 1620s, and a number of alterations revealed by cleaning and X-ray analysis in areas such as the hair and costume, demonstrated that the painting could not be a copy, but was Rubens’ lost masterpiece. Ben van Beneden, director of the Rubenshuis and a member of the Rubenianum, the Antwerp centre for Rubens scholarship, confirmed the attribution to Rubens. "The Head Study of the Duke of Buckingham is a rare addition to Rubens's portrait oeuvre showing how he approached the genre." Until now, only one British sitter painted by Rubens has been on display in Britain, the Earl of Arundel. 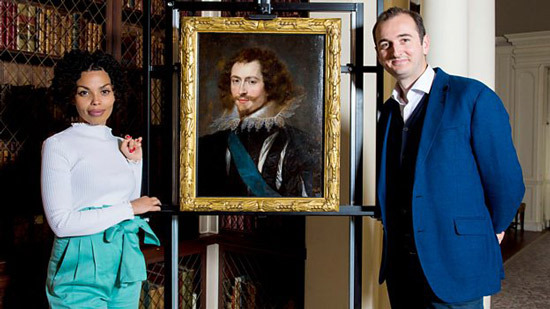 The newly discovered portrait will now go on display at Pollok House, and is only the second portrait by Rubens in a public collection in Scotland. Britain's Lost Masterpieces (W/T) (3x60') was commissioned by Mark Bell for BBC Four and the BBC executive producer is Emma Cahusac. It is produced and directed by Spike Geilinger and executive produced by Brendan Hughes and Harry Bell for Tern TV. In partnership with Art UK. Posted by Making A Mark on Wednesday, September 27, 2017 2 comments Who's linking to this post? I've got a lot of time for this competition - mainly because I think they pick good judges who tend to stick to the brief. It's also a competition which tends to select artists who go on to become selected for more art prizes - and winners of them - in the future. Bottom line - in career terms this is a really good art competition - with great prizes - for those who are sound and talented figurative artists. Approximately 200 artists are invited to deliver their actual works after initial selection from digital entries. Approximately 100 works will then be selected for exhibition in March 2018at the Mall Galleries, London. 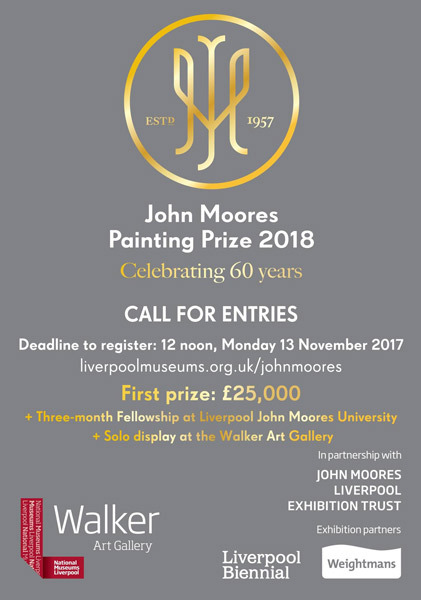 In terms of prizes it's certainly one of the more prestigious art prizes in the UK - particularly for younger artists who are eligible for two worthwhile prizes in addition to the others. 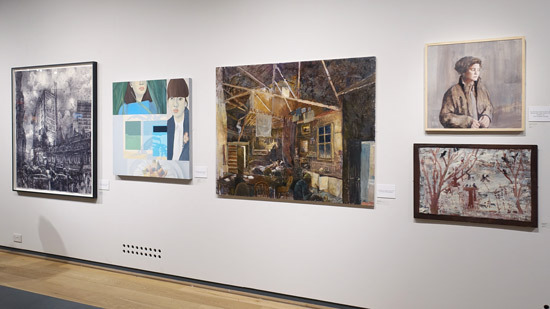 the Young Artist Award (£4,000) for young artists aged 25 or under. The aim is to promote and support fresh new talent. Past prizewinners are fans of the competition. Living artists over the age of 18, who are resident in the British Isles - irrespective of whether or not they are a British citizen. British citizens living abroad cannot enter. Two of the prizes are age-related. Despite highlighting this issue last year, it is still IMPOSSIBLE to tell from the website what the date is for determining age - which is extremely odd to say the least! Not good practice as it leads to scope for ambiguity and mistakes. The "normal rule" is that the determining date is the deadline for entry. Original - which (although they don't say) means in art competition terms that you can assert copyright for your work. What the law says is that your work is derivative and not eligible to claim copyright if you have copied another original artwork done by somebody else - and that includes photographs. 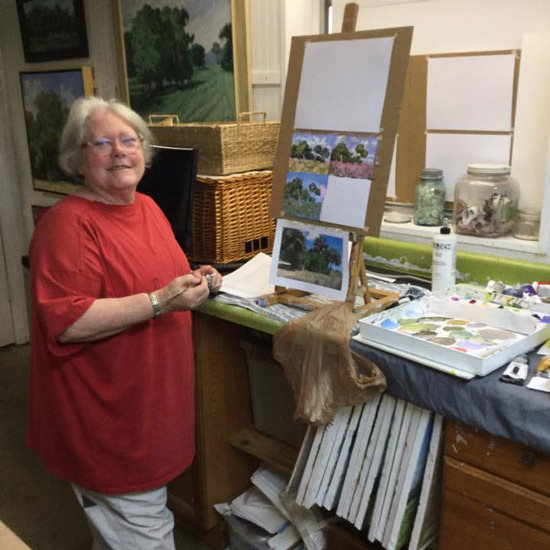 two-dimensional works in any painting or drawing media. All works must be for sale, except for commissioned portraits (which must be marked NFS on rear). Longest dimension - including frame - must not exceed 60 inches (152 cms). Posted by Making A Mark on Monday, September 25, 2017 0 comments Who's linking to this post? The Royal Society of Miniature Painters, Sculptors & Gravers was founded in 1896. and its Patron is HRH The Prince of Wales. 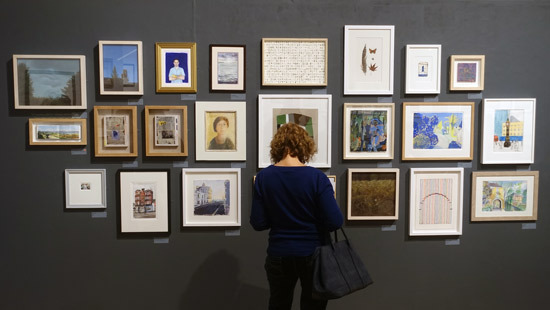 The 2017 Annual Exhibition - in the North Gallery at the Mall Galleries - was opened on Thursday afternoon by Dame Patricia Routledge. It closes on 1st October at 1pm. 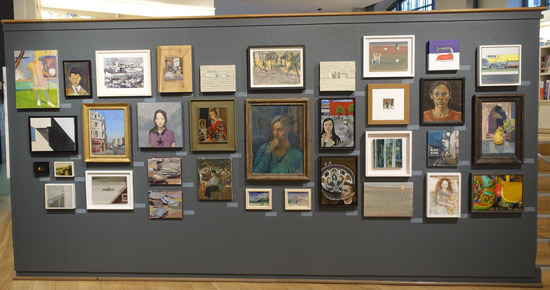 The exhibition comprises 534 pieces of miniature paintings, sculptures and fine art prints displayed in customised display cabinets which provide an excellent view of the work. I was supposed to be going but have been suffering from a bad case of laryngitis all week and was exhausted after my trip to the Galleries the previous day. I'm hoping to get to see it next week. I did however get to meet up with the RMS President Ros Pierson PRMS CFA(Oxon) PPHS MAA MASF on Wednesday and I gather the exhibition had got off to a very good start in terms of sales. 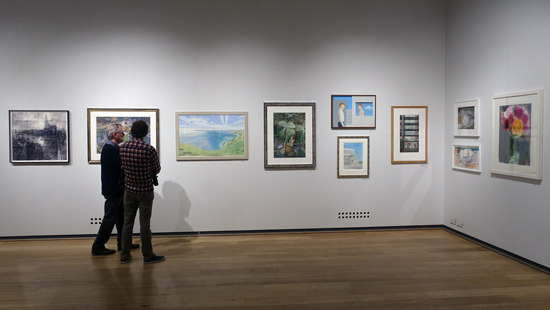 I guess being on at the same time as the Sunday Times Watercolour exhibition might have helped as a lot of the miniaturists work in watercolour. I'm so upset to have missed this presentation! I've followed Raoof at BP Portrait over the years (including this year) and have met him a number of times. He's a really excellent artist - both large and small. Raoof Haghighi is also a self-taught artist whose work has been seen in group and solo shows in the United Kingdom and Iran/Persia. Posted by Making A Mark on Saturday, September 23, 2017 0 comments Who's linking to this post? Not only can I find nothing to celebrate about the painting that won £10,000 First Prize I can find nothing to merit it even being hung in the exhibition. This year's competition is also unique in having the least press coverage in print and social media of any STWC prizewinner I've ever known. Hardly surprising really - and I'm quite sure that's NOT the aim of the sponsorship! Consequently this year I'm not going to focus on the prizewinners - except for one who merits her award. 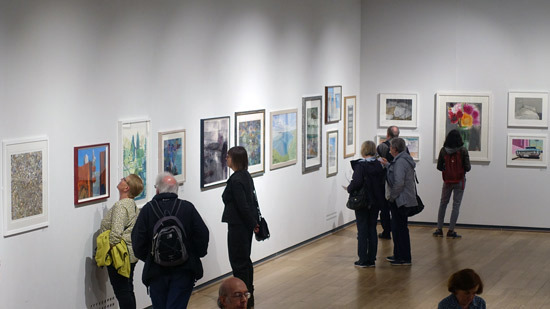 Instead, yesterday I decided to look for what I thought were the ten best watercolour paintings in the exhibition. By that I mean paintings using a water-based medium recognised by the watercolour societies and used in a way which means you can tell water had been used. Plus I'll be back at the weekend with a short video of the exhibition and more comments and observations - including some numbers I'm crunching. 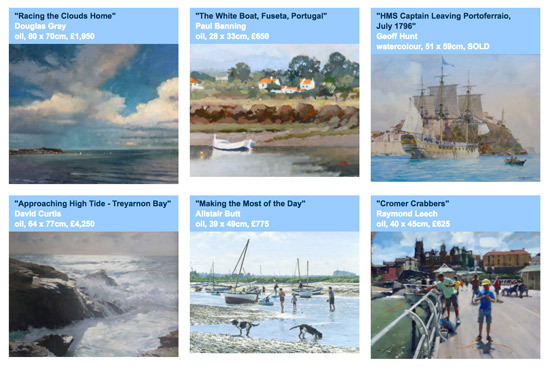 Below is my selection of the ten best paintings in the competition. I'd love to know what your ten paintings are. Tell me which ones you like best. 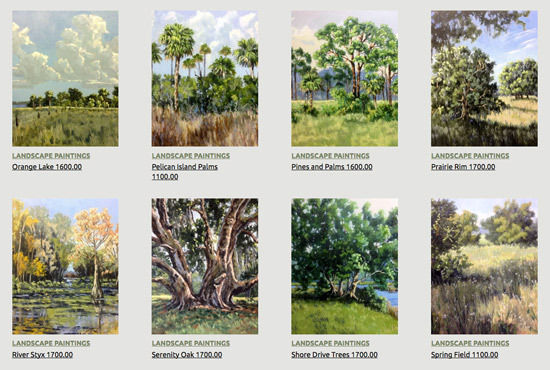 You can see the paintings in the competition - but not their relative size - on the competition website. If you click a painting you then get a bigger version and if you click it again you then get a much bigger version. Some have done a better job than others at representing what they are like in reality. I have issues with the ones which digitally enhanced their pics to get selected because the difference - and the difference between image and reality is very marked - but the judges appear to have been totally oblivious to this. Other exhibitions don't hang paintings where this has happened. Posted by Making A Mark on Thursday, September 21, 2017 7 comments Who's linking to this post? 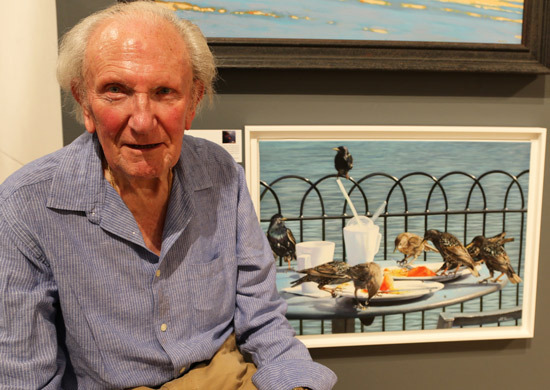 Today the death of David Shepherd CBE FRSA, the conservationist and renowned painter of planes, trains and wildlife, was announced by his family via his Foundation website. He died yesterday, on 19th September 2017, age 86. 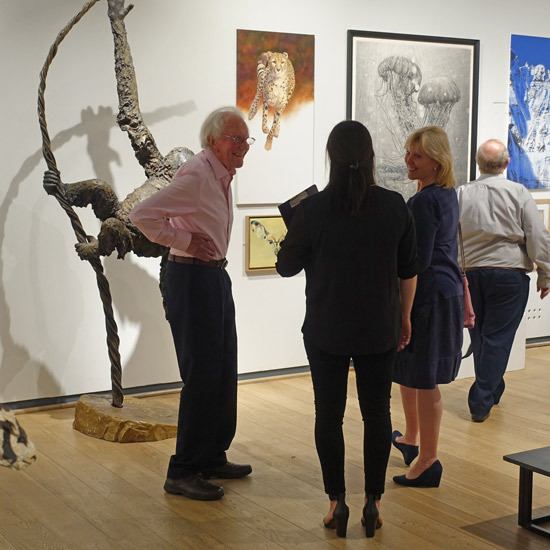 I remember thinking how frail he looked at the end of June at the splendid Wildlife Artist of the Year Exhibition at the Mall Galleries. Moving more slowly, a little more bowed and a little less weight than I remembered - and I was used to seeing at the preview at the exhibition which he started to raise funds for conservation. However there was still the twinkle in the eye and the interest in what artists had painted and what people had done and were planning to do next in the world of wildlife art. I won't attempt any sort of recap of his career. His website has an admirable one which draws out both the story of his life and his very many achievements and awards. he became a conservationist overnight when he came across 255 dead zebra at a poisoned waterhole in Tanzania. Throughout his career David tried to do all he could to repay the enormous debt he felt he owed to the elephants, tigers and other animals that gave him so much success as an artist. ‘Tiger Fire’ was one of his first major fund-raising successes, raising £127,000 (equivalent to £1.4 million in today’s money) for Indira Gandhi’s Operation Tiger in 1973. I'm sure very many wildlife artists will want to remember him best in terms of what he meant to them. Please feel free to add a comment below. Messages of condolence can also be emailed to mandy(DOT)gale(AT)davidshepherd.org. 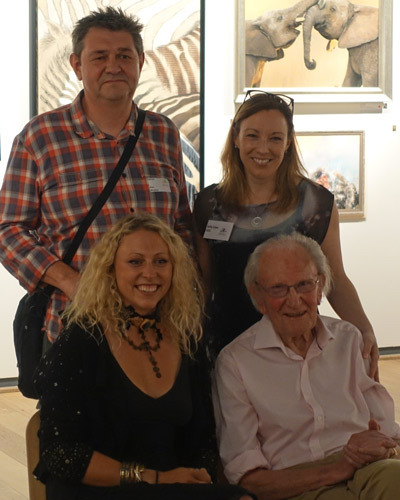 I know that when he started the Wildlife Artist of the Year competition, as well as raising a huge amount of money for conservation he also enabled very many wildlife artists to show their art in a world-class exhibition. I was always amazed at the number of international artists I met at the exhibition and whose work I saw. 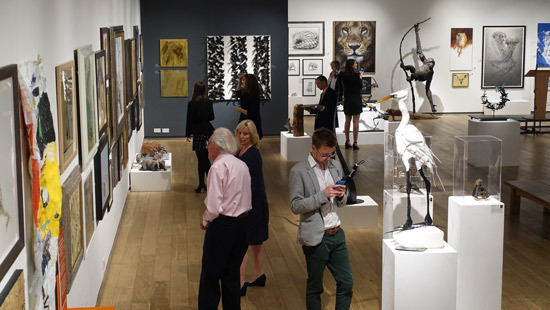 It's an exhibition which enjoys a very special kudos in the world of wildlife art - particularly for those who were concerned about the conservation of wild animals threatened with extinction. Below I'll share just a few of my memories of David at the exhibitions over the years. - he had no idea he'd won his category! Posted by Making A Mark on Wednesday, September 20, 2017 2 comments Who's linking to this post? Posted by Making A Mark on Tuesday, September 19, 2017 0 comments Who's linking to this post? This time he's won by producing an equally large drawing - also of the town of Pothea on Kalymnos. This time he's used poster paint (I assume that's the yellow background) and felt pens. The fridge magnet reference relates to the two boards of bridge magnets with "scenes from Greece" on them which are then reproduced in little 'thought' bubbles on the edge of the paper. Each is accompanied by a comment from the artist – ‘Athens – never been here’, ‘Cyprus ‘08 ok-ish’, ‘Zante Town – Euro Spar’. It reminds me of some of the drawings produced in the past which used to illustrate a journey with small drawings around the edge showing scenes from the route. Quite why it should be yellow is not explained. 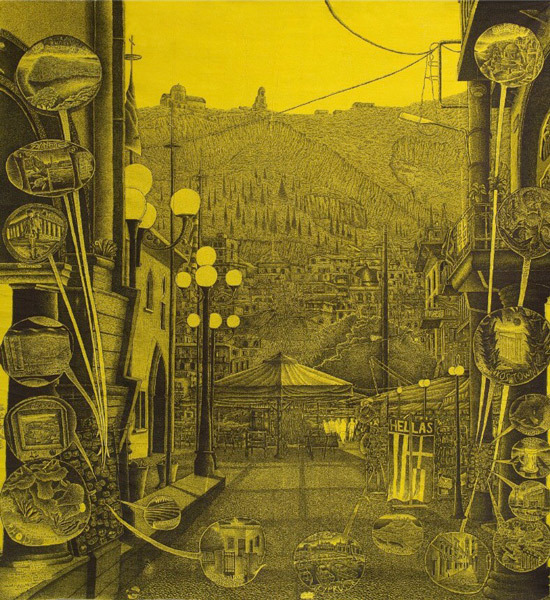 Gary Lawrence, Yellow Kalymnos with Fridge Magnets, 2017. 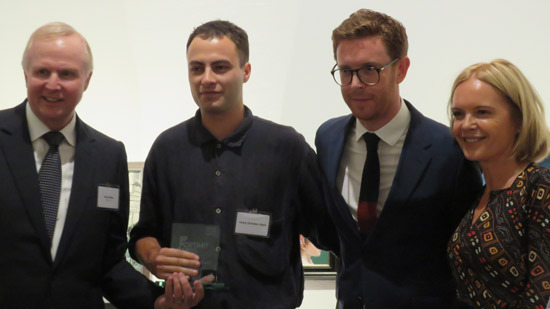 The artist is from Wethersfield, Essex and was also shortlisted for the Derwent Art Prize 2015. Such a rule means that the benefit of the prize, not to mention the prize money, is spread amongst the widest pool of deserving artists. Ultimately that means it has the scope to enhance the careers of more artists - and that's no bad thing. Nothing to stop other artists winning the other prizes more than once - but for me the rule of "win and that's it" for First Prize has a cogent rationale in the context of competitions generally and the aims of this one in particular. Nicholas Usherwood, Art Critic and Curator and trustee of the Evelyn Williams Trust. She's a very impressive artist with an outstanding portfolio of 'proper' drawings. Her figurative drawings explore race identity, belonging, class and power. 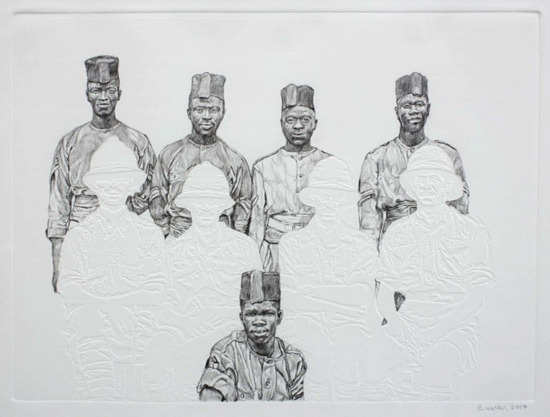 This drawing comes from her Shock and Awe series of drawings about the contribution of Black servicemen and women to the British Armed Forces and war efforts from 1914 to the present day. It includes embossed lines to represent the non-Black service personnel. Posted by Making A Mark on Monday, September 18, 2017 0 comments Who's linking to this post? Posted by Making A Mark on Thursday, September 14, 2017 0 comments Who's linking to this post? Posted by Making A Mark on Tuesday, September 12, 2017 8 comments Who's linking to this post? I came across this video on training the eye and teaching people how to look last week. It's about the clarity that comes from real perception. a document of the long and successful teaching career, and .... a teaching tool for generations to come. deneficial to all visual students whether designers or artists. 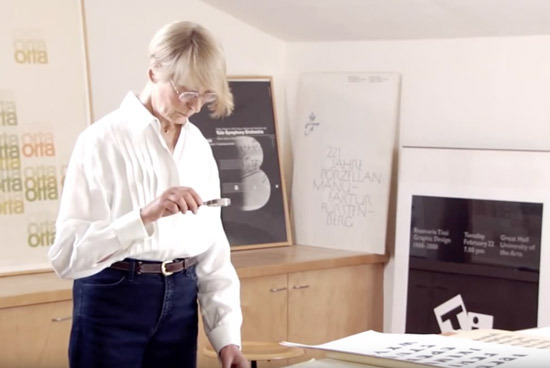 a 2012 educational documentary film about graphic design and the teaching of Inge Druckrey and some of her students and colleagues. Teaching to See - There’s a difference between looking and seeing. Teaching to See explores the work of designer and educator Inge Druckrey. Posted by Making A Mark on Monday, September 11, 2017 1 comments Who's linking to this post? Posted by Making A Mark on Sunday, September 10, 2017 1 comments Who's linking to this post?